dots Softwarehttp://www.dots.de Digital printing new from dots software! en-GB dots Software Thu, 18 Apr 2019 22:18:30 +0200 Thu, 18 Apr 2019 22:18:30 +0200 from dots with help: TYPO3 EXT:news news-285 Mon, 07 Jan 2019 11:15:00 +0100[Success Story] An insurance companies enhanced the flexibilty of its in-house print shophttps://www.dots.de/en/print-blog/success-story-an-insurance-companies-enhanced-the-flexibilty-of-its-in-house-print-shop/ From its internal printing facility, the Concordia Versicherungen in Hanover, Germany, supplies sales collateral printed in full colour to both its internal and external sales force all over Germany. Thanks to a highly individual concept devised by Konica Minolta, the in-house print room can now offer its print services more flexibly and pursue its plans to extend the portfolio in the future. From its internal printing facility, the Concordia Versicherungen in Hanover, Germany, supplies sales collateral printed in full colour to both its internal and external sales force all over Germany. Thanks to a highly individual concept devised by Konica Minolta, the in-house print room can now offer its print services more flexibly and pursue its plans to extend the portfolio in the future. Concordia Versicherungen, with about 1,250 employees, ranks among the medium-sized insurers in the field of accident and indemnity insurance in Germany. They operate their own in-house printing plant which produces flyers and brochures for their internal and external sales force all over Germany. For this type of sales material, quality is crucial, especially with regard to the colours, which must be in line with the CI. As the previous contract with another manufacturer expired, the customer was open to new concepts to streamline its workflow and produce more efficiently. Instead of just replacing the previous setup (a color system, a monochrome system), Konica Minolta offered a concept in which two color systems are combined as a tandem installation. One system is connected to a hot-melt glue binder and the other to a booklet maker. An additional monochrome system completed the setup. This setup makes production more flexible and efficient and and also more fail-safe. AccurioPro Flux Ultimate was installed to centrally manage all incoming print jobs and to centrally control all three devices. Its printer cluster function was the key feature to operate the tandem color devices. With the help of AccurioPro Flux, a web shop will soon be implemented to enable insurance agencies to conveniently order advertising material online. The new setup enables convenient and automated production of brochures through the integrated finishing devices. The tandem installation of the two colour systems guarantees constant colour quality and ensures reliability. AccurioPro Flux makes it possible to manage all print jobs centrally and conveniently. By offering a web shop for 24/7 online ordering to the agencies, the company intends to create additional added value in the future. Read the entire Success Story (PDF). ]]> news-282 Thu, 03 Jan 2019 16:40:00 +0100[Success Story] Two colleges in the Netherlands use AccurioPro Flux to modernize their in-house printing facilityhttps://www.dots.de/en/print-blog/success-story-two-colleges-in-the-netherlands-use-accuriopro-flux-to-modernize-their-in-house-printing-facility/ The SORG Foundation has modernized its print room with a sophisticated concept consisting of high-performance production printers, integrated finishing devices and the AccurioPro Flux software solution. Automated and time-saving processes require less manual intervention and eliminate the need to outsource jobs at peak times. The SORG Foundation has modernized its print room with a sophisticated concept consisting of high-performance production printers, integrated finishing devices and the AccurioPro Flux software solution. Automated and time-saving processes require less manual intervention and eliminate the need to outsource jobs at peak times. The SORG Foundation operates two colleges in the Netherlands, Van Lodenstein College and Hoornbeeck College. The colleges are spread over 13 locations with over 1,000 employees. The in-house printing plant prints the materials for all locations, mostly teaching materials in the form of brochures with various bindings. Konica Minolta won the tender for the modernization of the in-house print shop thanks to a suitable hardware configuration in conjunction with AccurioPro Flux. The finishing options are directly integrated into the new, more powerful production printers. By using an integrated booklet making unit, brochures can be professionally folded and stapled without the need for manual intervention. By using AccurioPro Flux in conjunction with the new machines, the work processes could be automated to a large extent, so that the print room can be operated by just one operator and jobs no longer have to be outsourced at peak times. The new web shop, realized with AccurioPro Flux, offers an intuitive user interface. This allows the in-house print shop to receive orders 24/7 and it no longer has to deal with paper order forms. The in-house print shop can now offer its customers a convenient 24/7 ordering option. The orders arrive at the print shop in a structured manner and can be produced there efficiently. Thanks to the automation of many processes and the elimination of time-consuming manual work steps, orders are produced on schedule even at peak times and no longer have to be outsourced. ]]> news-279 Thu, 01 Nov 2018 11:15:00 +0100More standard user seats in AccurioPro Fluxhttps://www.dots.de/en/print-blog/more-standard-user-seats-in-accurioproflux/ With immediate effect, the number of print operators who can work simultaneously with AccurioPro Flux Premium or Flux Ultimate increases to three. This makes the solution even more attractive for small teams. ]]> news-276 Mon, 01 Oct 2018 11:30:00 +0200AccurioPro Label Impose: Version 1.2.2 releasedhttps://www.dots.de/en/print-blog/accuriopro-label-impose-version122-released/ This service release enhances the export function for print data in AccurioPro Label Impose. This service release enhances the export function for print data in AccurioPro Label Impose. When using the export function in previous versions of AccurioPro Label Impose, a whole row of artworks was exported, even when only a single artwork was selected. This behavior is very convenient when artworks are exported in order to produce a cutting tool, because in this case the whole row of artworks is needed. But in other cases, when only one specific artwork instead of the whole row should be exported, this feature caused confusion. We therefore changed the export behavior. Now only the selected artworks are exported. That means if one single artwork is selected, only the single artwork is exported. In order to export a whole row of artworks, the whole row needs to be selected during the export. The export behavior now corresponds to the standard behavior which is also known from other applications. When exporting artwork(s), the user can enable or disable the option "Remove 1 mm (0.394 in) page space when exporting". But this option was ignored when the user tried to export selected artworks instead of starting the export without having any artworks selected. We fixed this bug. Now the artworks are exported with the chosen settings independent of whether artworks had been selected or not. The update is available at your local Konica Minolta partner or authorized dealer. If you have a valid Software Maintenance Plan (SMP), the update to version 1.2.2 is free of charge. ]]> news-273 Fri, 10 Aug 2018 11:05:00 +0200How-tos for AccurioPro Flux: Learn more about color management and other topicshttps://www.dots.de/en/print-blog/how-tos-for-accuriopro-flux-learn-more-about-color-management-and-other-topics/ We published five new How-tos about how to use AccurioPro Flux to control the color management of your printers and how to quickly imposition urgent jobs without prior product configuration. We also introduce you to various methods for combining several print jobs into one order. ]]> news-270 Fri, 27 Jul 2018 11:05:00 +0200AccurioPro Label Impose: Version 1.2 releasedhttps://www.dots.de/en/print-blog/accuriopro-label-impose-version-12-released/ An update for AccurioPro Label Impose is available, which focuses on performance improvements when impositioning VDP documents (PDF/VT) with high page count. ]]> news-267 Tue, 17 Jul 2018 15:47:00 +0200AccurioPro Flux: Version 7.8.2 released (Service release)https://www.dots.de/en/print-blog/accuriopro-flux-version-782-released-service-release/ The service release adds support for additional controllers and new functions for the Flux Raster Editor option, which allows you to edit scanned documents and image files. ]]> news-264 Fri, 20 Apr 2018 09:35:00 +0200AccurioPro Flux: Version 7.8 releasedhttps://www.dots.de/en/print-blog/accuriopro-flux-version-78-released/ For the new version of AccurioPro Flux we have completely redesigned the job import and added new imposition schemes. PDF page boxes contained in print files can now be controlled directly in Flux and the job information can also be changed after submission. For the new version of AccurioPro Flux we have completely redesigned the job import and added new imposition schemes. PDF page boxes contained in print files can now be controlled directly in Flux and the job information can also be changed after submission. The highlight of the new version is the completely redesigned job import in the Flux Workstation. We have split the import dialog into three steps, which you can individually hide as needed to shorten and speed up the import. At the end of the import process, you can switch to the order list as before, or you can immediately open the job in the editor to continue processing the job seamlessly. In addition, we have added a Quick Import feature where you can define presets so that you do not have to fill in any job ticket during the import. This is a new and the fastest way to import files. 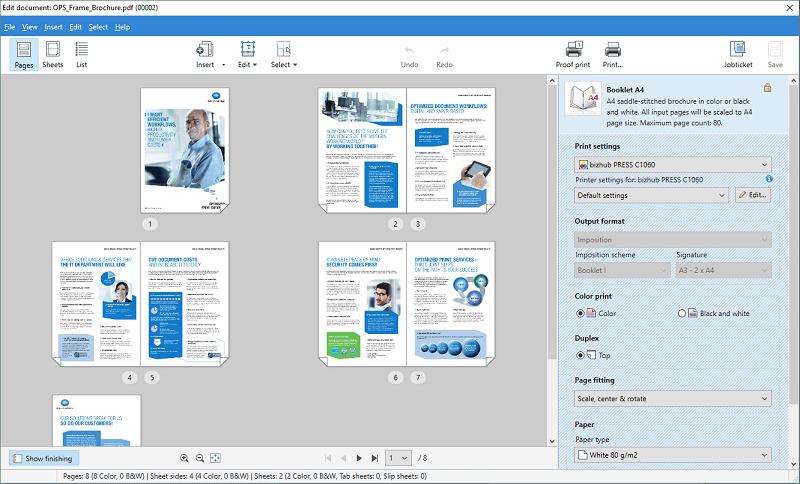 In previous versions, PDF page boxes contained in print files (e.g. trim box, crop box, media box) have been detected and applied automatically. Now you can decide for each print product individually and flexibly per job which page box to use. This for example allows printing crop marks contained in a file if they are needed for further processing rather than automatically cropping the file to the trim box as it was done before. It often happens that job information must be changed after the submission to the print room, either because the delivery date needs to be changed, account information must be added or an address is incomplete. The operator can now make these changes quickly and easily. In order to track all changes, they are documented in the order history. In addition, a modified version of the jobticket is created while the original jobticket is still available. The update is available at your local Konica Minolta partner. If you have a valid Software Maintenance Plan (SMP), the upgrade to version 7.8 is free of charge. ]]> news-261 Tue, 10 Apr 2018 10:45:00 +0200[Success Story] The Methodist Ladies' College prints efficiently with AccurioPro Fluxhttps://www.dots.de/en/print-blog/success-story-the-methodist-ladies-college-prints-efficiently-with-accuriopro-flux/ One of the leading independent Australian girls' schools has reorganized its in-house print shop and now uses AccurioPro Flux to transfer print jobs to the print room and for production. One of the leading independent Australian girls' schools has reorganized its in-house print shop and now uses AccurioPro Flux to transfer print jobs to the print room and for production. Our colleagues from Konica Minolta Australia created an interesting case studie about the Methodist Ladies' College in Sydney which – among other changes – now uses AccurioPro Flux in their in-house print shop that now needs to be operated with less staffing while offering additional services: Online submission of print jobs and and real-time status tracking of all orders. The college also decided to turn their print room into a managed print room, staffed full-time by a Konica Minolta employee. 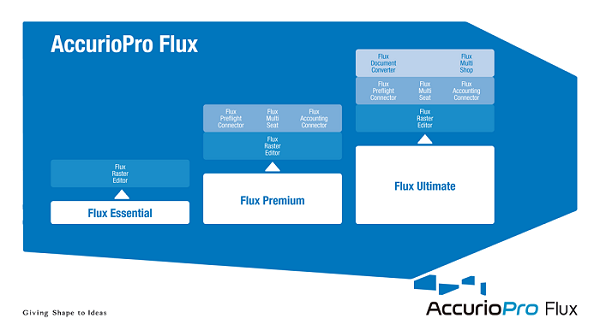 ]]> news-258 Thu, 14 Dec 2017 12:10:00 +0100[Press release] New Flux Preflight Pro module for AccurioPro Flux integrates pdfToolbox technology from callas softwarehttps://www.dots.de/en/print-blog/press-release-new-flux-preflight-pro-module-for-accuriopro-flux-integrates-pdftoolbox-technology-from-callas-software/ Flux Preflight Pro is a new option for AccurioPro Flux which enables the use of callas pdfToolbox to automatically check and optimize files for printing without requiring any additional manual steps. ]]> news-255 Wed, 08 Nov 2017 10:20:00 +0100AccurioPro Label Impose: Version 1.0.6 releasedhttps://www.dots.de/en/print-blog/accuriopro-label-impose-version-106-released/ AccurioPro Label Impose is now available in version 1.0.6 and has received some new features with the latest updates. The innovations of the last versions are summarized for you in this article. ]]> news-252 Thu, 28 Sep 2017 09:36:00 +0200AccurioPro Flux: Version 7.6 releasedhttps://www.dots.de/en/print-blog/accuriopro-flux-version-76-released-1/ A new option is available in this new version of AccurioPro Flux: Flux Preflight Pro. It makes preflighting and correcting incoming print data even easier. But there are also many new features in the make-ready part to discover. ]]> news-249 Thu, 20 Jul 2017 15:22:00 +0200AccurioPro Compile released: Compile & print documentation easilyhttps://www.dots.de/en/print-blog/accuriopro-compile-released-compile-print-documentation-easily/ AccurioPro Compile makes the compilation and printing of extensive documentation a breeze. It is the successor of Printgroove JT Compile, which now comes with new branding. ]]> news-246 Fri, 28 Apr 2017 10:32:28 +0200New in version 7.4: Repeat range programming fast & easily until the end of the documenthttps://www.dots.de/en/print-blog/new-in-version74-repeat-range-programming-fast-easily-until-the-end-of-the-document/ Edit print jobs with repeating page settings, e.g. mailings, faster and more easily with AccurioPro Flux by repeating the print settings of a page range with a few clicks until the end of the document. ]]> news-243 Fri, 07 Apr 2017 15:00:00 +0200AccurioPro Flux: Version 7.4 releasedhttps://www.dots.de/en/print-blog/accuriopro-flux-version74-released/ Version 7.4 of our print workflow solution AccurioPro Flux has been released. Learn more about the integration of pdfToolbox technology by callas software and the new features included in this new version. 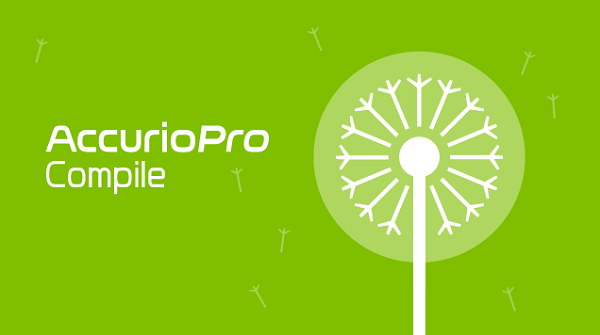 Version 7.4 of our print workflow solution AccurioPro Flux has been released. Learn more about the integration of pdfToolbox technology by callas software and the new features included in this new version. As announced earlier, we have focused on new features for the make-ready part and the web shop in version 7.4 of AccurioPro Flux. In addition, we integrated pdfToolbox technology from callas software, a leading company for automatic PDF processing. Please also read the corresponding press release. For products where the standard delivery time is too short, because they require, for example, more elaborate finishing, you can define a production time that is automatically added to the delivery time. Our printer clients, the Flux Printer and the Flux Web Printer, can now be used again in a Citrix environment. You can upload multiple print files at the same time, select a product and create multiple print jobs in one step. If you have a valid Software Maintenance Plan (SMP), the upgrade to version 7.4 is free of charge. ]]> news-240 Thu, 06 Apr 2017 15:30:00 +0200[Press release] AccurioPro Flux now includes pdfToolbox technologyhttps://www.dots.de/en/print-blog/press-release-accuriopro-flux-now-includes-pdftoolbox-technology/ From version 7.4, AccurioPro Flux uses pdfToolbox technology from callas software, a leading company for automatic PDF processing, for generating previews and converting PostScript files to and from PDF. From version 7.4, AccurioPro Flux uses pdfToolbox technology from callas software, a leading company for automatic PDF processing, for generating previews and converting PostScript files to and from PDF. ]]> news-237 Thu, 23 Mar 2017 11:29:20 +0100AccurioPro Flux: Version 7.4 to be released in Aprilhttps://www.dots.de/en/print-blog/accuriopro-flux-version74-to-be-released-in-april/ In April, the latest version of our AccurioPro Flux print workflow solution will be released with new make-ready features and new functions in the web shop. 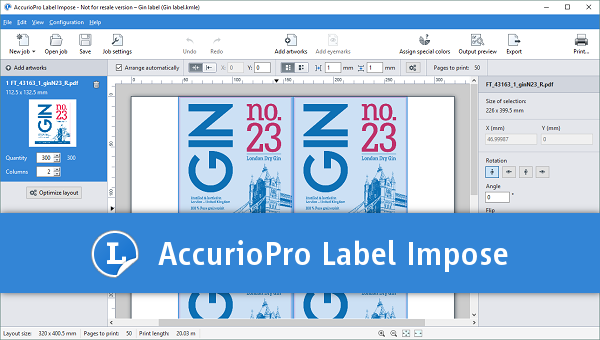 ]]> news-233 Tue, 10 Jan 2017 11:59:00 +0100AccurioPro Label Impose: Easy-to-use software tool for label printinghttps://www.dots.de/en/print-blog/accuriopro-label-impose-easy-to-use-software-tool-for-label-printing/ AccurioPro Label Impose has been shown for the first time and with great success at the drupa 2016 in Düsseldorf. Meanwhile, the software has been officially released and has been available for a few months now at Konica Minolta. It is high time for having a closer look at the software tool. ]]> news-230 Wed, 30 Nov 2016 16:35:00 +0100AccurioPro Flux: Version 7.2 includes two new options and the Flux Panelhttps://www.dots.de/en/print-blog/accuriopro-flux-version-72-includes-two-new-options-and-the-flux-panel/ Version 7.2 comes with two new options: The Flux XML Connector and the Flux CCS Connector both integrate new solutions into our workflow. 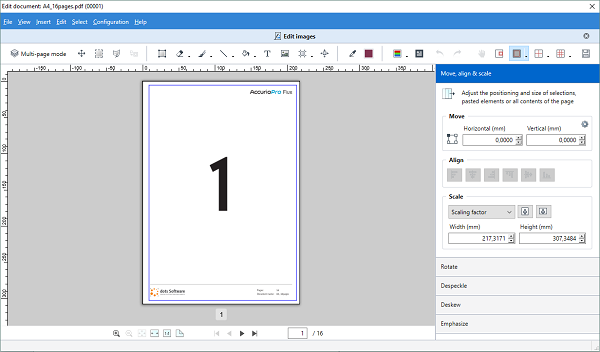 In addition, the new Flux Panel allows to release print jobs directly at the panel of the printing device. ]]> news-227 Fri, 29 Jul 2016 15:40:00 +0200Konica Minolta JT Suite becomes AccurioPro Flux | Version 7.0 releasedhttps://www.dots.de/en/print-blog/konica-minolta-jt-suite-becomes-accuriopro-flux-version70-released/ Version 7 of our printmanagement solution comes with a completely new name: AccurioPro Flux. There are also changes to the product structure and many new features that will simplify the printing process. ]]> news-215 Wed, 24 Feb 2016 09:40:00 +0100New in version 6.2: Single sign-on (SSO) for the web-to-print modulehttps://www.dots.de/en/print-blog/new-in-version62-single-sign-on-sso-for-the-web-to-print-module/ The new single sign-on function simplifies the authentication in the web-to-print online shop within a closed network, because the user logs on the network and gains access to the web shop without further authentication. The new single sign-on function simplifies the authentication in the web-to-print online shop within a closed network, because the user logs on the network and gains access to the web shop without further authentication. Single sign-on is an authentication process in which a user logs on a network once and thus gains access to various applications without having to sign in these applications again. As our web-to-print online shop is optimized for the B2B sector, it is often used by in-house print shops in corporations, administrations and universities, offering their users convenient ordering for printed products. In this environment, the users are mostly registered in a closed network, for example a corporate network or the network of an university or administration, where they log on with a username and password. The log-on to the network is often linked with the Windows log-on. Thanks to the new SSO feature, the authentication for the web-to-print shop is linked with the registration at the network. An additional log-on with different credentials is not required. This also has the advantage, that when adding or removing users from the corporate network, these changes will also take effect in the web-to-print shop. The maintenance of an additional user database is no longer necessary. We support SSO via SAML 2.0 and Windows Integrated Authentication (IWA). 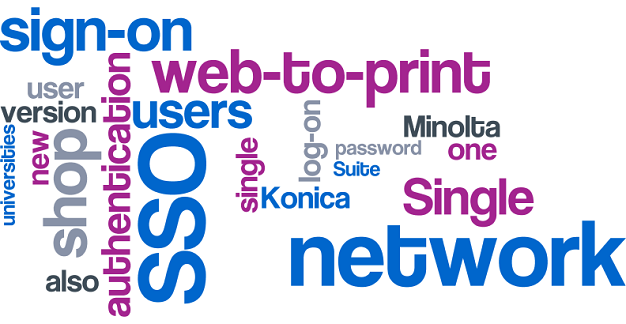 Single sign-on is included by default in version 6.2 of Konica Minolta JT Suite. ]]> news-212 Fri, 12 Feb 2016 14:01:00 +0100New in version 6.2: Filter the job list for an efficient processing of print jobshttps://www.dots.de/en/print-blog/new-in-version62-filter-the-job-list-for-an-efficient-processing-of-print-jobs/ In version 6.2 of Konica Minolta JT Suite, it is now possible to filter the job list by various criteria. The filters help the print operator to keep track and to process print jobs quickly and efficiently. ]]> news-203 Thu, 17 Dec 2015 15:38:00 +0100Konica Minolta JT Suite 6: Service release with new features availablehttps://www.dots.de/en/print-blog/konica-minolta-jt-suite-6-service-release-with-new-features-available/ We just published a Service release for Konica Minolta JT Suite 6. It includes several bug-fixes and some new features. We just published a Service release for Konica Minolta JT Suite 6. It includes several bug-fixes and some new features. The Service release updates all modules of Konica Minolta JT Suite 6 in all current versions (6.0 to 6.2). 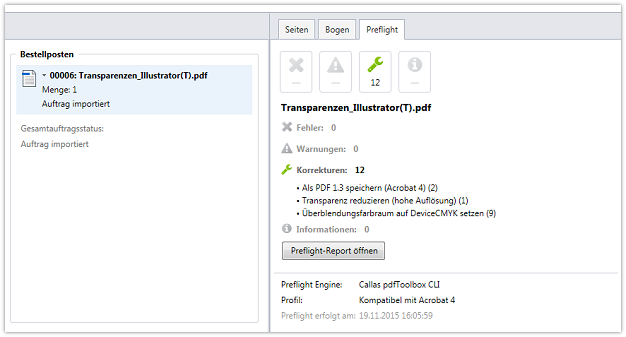 Particularly interesting are the new resolutions for processing PDF documents in JT Raster Editor. It gives the user a high degree of control over the image quality and processing speed. The Service release is only valid for all modules of Konica Minolta JT Suite 6. You cannot update previous versions (e.g. Printgroove JT Web 5, Printgroove JT Man 5, Printgroove JT Suite 5). All customers with a valid software maintenace plan are eligible for an update free of charge. Just contact your local Konica Minolta dealer. ]]> news-200 Fri, 04 Dec 2015 11:16:00 +0100New in version 6.2: Direct import and comfortable editing of scanned documentshttps://www.dots.de/en/print-blog/new-in-version-62-direct-import-and-comfortable-editing-of-scanned-documents/ Now you can not only import documents directly into our application by using the scan function of your printing system, but you can also rectify flaws in the document resulting from scanning by using our powerful editor. 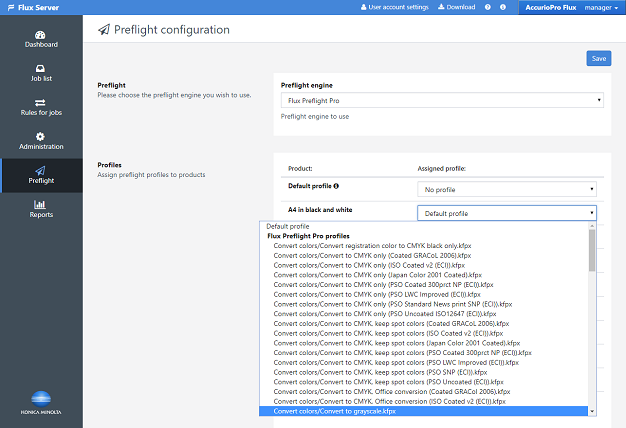 ]]> news-197 Fri, 20 Nov 2015 11:12:00 +0100New in version 6.2: Integrate external preflight applications to check and repair print fileshttps://www.dots.de/en/print-blog/new-in-version-62-integrate-external-preflight-applications-to-check-and-repair-print-files/ The latest version 6.2 of our software solution comes with a new option that allows the easy integration of external preflight applications. It provides complete new ways of not only checking print files but also of repairing them. ]]> news-194 Fri, 30 Oct 2015 14:22:00 +0100Now available: Version 6.2 of Konica Minolta JT Suite comes with two new optionshttps://www.dots.de/en/print-blog/now-available-version-62-of-konica-minolta-jtsuite-comes-with-two-new-options/ JT Raster Editor and JT Preflight Connector are two new options that simplify and automate your daily tasks in the print room. 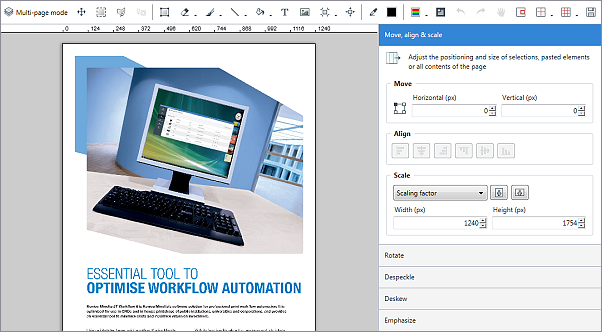 More new features such as color management, custom filters for the job list as well as an integrated scan workflow will also help you to optimize your print workflow. ]]> news-191 Wed, 28 Oct 2015 16:27:00 +0100Learn more about Konica Minolta JT Suite 6 on our dedicated product websitehttps://www.dots.de/en/print-blog/learn-more-about-konica-minolta-jtsuite6-on-our-dedicated-product-website/ Gain an overview of the new modular structure, learn more about the benefits of the individual modules and request a demo version. ]]> news-188 Thu, 17 Sep 2015 15:34:00 +0200Integrate third party devices into Konica Minolta JT Suite 6https://www.dots.de/en/print-blog/integrate-third-party-devices-into-konica-minolta-jt-suite-6/ Do you utilize printing devices from different manufacturers and are you interested in a software solution for your entire print workflow? Then continue reading about our solution. Do you utilize printing devices from different manufacturers and are you interested in a software solution for your entire print workflow? Then continue reading about our solution. Initially we designed and programmed our software solutions to be compatible with all PostScript-capable output devices. This was achieved with a special file format (DPML - dots print meta language). 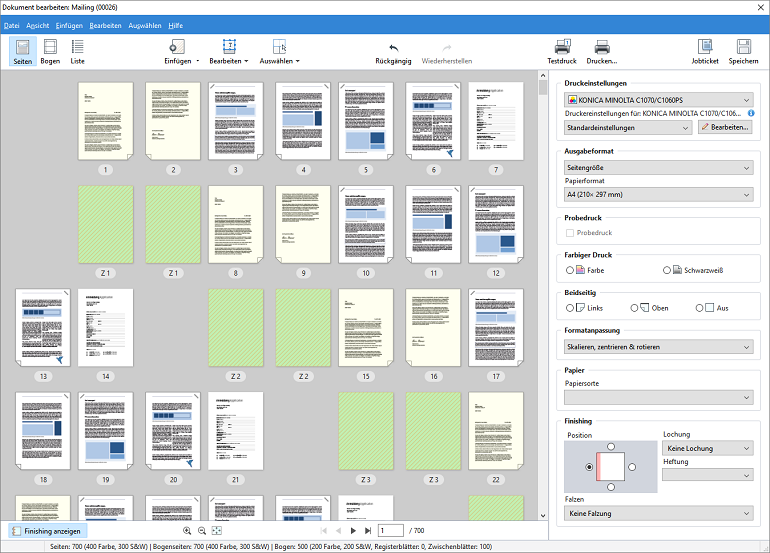 We kissed this concept goodbye a while ago in favor of a PDF workflow and its many advantages. Our current products communicate with Konica Minolta production machines in an excellent manner: The software knows when a door is left open, toner runs low or whether an order send to the printer is actually printed - or not. We can achieve this because we directly access those devices and their controllers. But what about the integration of printing devices from other manufacturers? We know from our support team, customer visits and market surveys that a homogenous set of devices is rather the exception than the rule. Most operators command a rather colorful set of devices from different manufactures and generations and very different finishing options. Using a software only capable to address devices from a single manufacturer in such a environment tends to be very frustrating. If the supported machine breaks, the whole workflow comes to a grinding halt. Other example: This machine becomes the eye of the needle if there is a sudden influx of many but low volume orders. Such conditions do not allow an unifies workflow but demand permanent manual intervention. For these reasons we offer a special option for our Konica Minolta JT Suite 6 software: Integration of third party devices. This integration cannot be as deep as with Konica Minolta devices but should allow for a unified workflow across all devices. This option is not an off the shelf product. All manufacturers use their own formats, protocols, controllers and procedures. Therefore our customization department needs to check every single case and decide which level of effort is necessary to achieve the possible support of our software. This option is already available from the Basic module and it will not break when you advance to the other modules. Functionality will also remain intact if and when you update or upgrade our products. If you are interested in such a integration ask your local Konica Minolta contact person for details. We can then write your individual offer containing information about which devices or functions can be supported. ]]> news-180 Fri, 07 Aug 2015 12:39:00 +0200Service release for version 6.0 availablehttps://www.dots.de/en/print-blog/service-release-for-version-60-available/ This Service release integrates selected color management settings, adds support for new controller versions and provides major bug fixes. ]]> news-183 Wed, 05 Aug 2015 11:23:00 +0200Success Story: How the GDV optimized its print workflow with the help of our software solutionshttps://www.dots.de/en/print-blog/success-story-how-the-gdv-optimized-its-print-workflow-with-the-help-of-our-software-solutions/ The GDV, the federation of private insurers in Germany with about 460 members, was looking for a print management solution fulfilling special requirements regarding tab labeling. Our customized combination of Printgroove JT Compile and Printgroove JT Man won the deal.